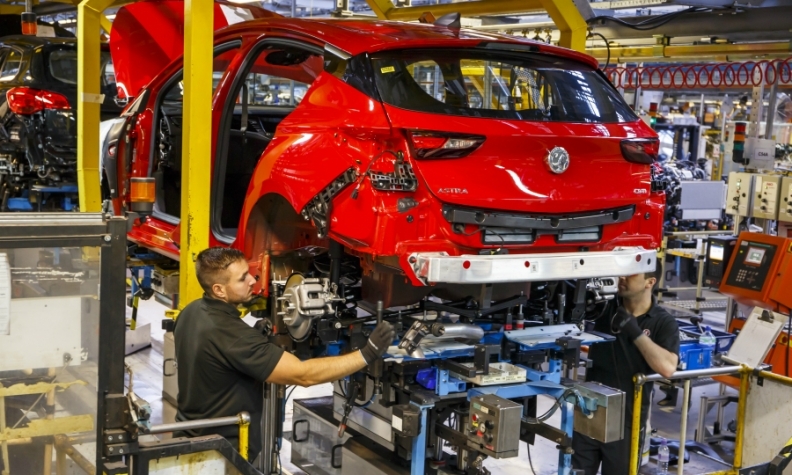 Vauxhall builds the Astra at its Ellesmere Port plant in northern England. LONDON -- UK car production rose by an annual 7.5 percent in January to hit its highest since 2008, as strong demand for exports compensated for a decline in demand at home, the Society of Motor Manufacturers and Traders (SMMT) said in a statement on Thursday. Overall output hit 147,922 vehicles due to a 11 percent increase in sales to overseas markets, according to the SMMT. However, there are concerns about the future of production at General Motors' UK car plant after PSA said it was considering a takeover of GM's European operations, which are branded as Vauxhall in Britain and Opel on the continent. Vauxhall's Ellesmere Port plant in northern England built nearly 120,000 vehicles out of a UK total of 1.72 million cars last year. Politicians and unions are seeking guarantees from PSA over future output. The UK's overwhelmingly foreign-owned car industry, which backed remaining in the European Union, is also worried about any potential tariffs as a result of Brexit which could make production at their plants uncompetitive. "Future growth will depend upon maintaining our competitiveness, not least in terms of securing a future trade deal with the EU that allows us tariff-free access to our biggest market," SMMT CEO Mike Hawes said in the statement.